In Cather's My Mortal Enemy, on the first day of young Nellie Birdseye's visit to Myra Henshawe in New York, she sits in a snowfall in Madison Square Garden and contemplates "St. Gaudens' Diana, of which Mrs. Henshawe had told me, stepp[ing] out freely and fearlessly into the grey air." Diana was a Roman goddess of several faces: enchanting as chaste huntress, protector of youth, and moon goddess, but also fierce and vengeful, as when she demanded a maiden sacrifice before allowing the Greeks to sail to Troy.This uncertainty between good and evil makes her the perfect alter-ego for Mrs. Henshawe, as My Mortal Enemy, so riddled with moon imagery, explores the vivid contrasts in Myra's character. The Diana that Nellie saw graced the tower of Stanford White's Madison Square Garden, which was demolished in 1925, the year before My Mortal Enemy was published. A bronze reduction of the statue, together with many other works by Augustus St. Gaudens (1848-1907, arguably the finest American sculptor of the belle epoque) can be seen at his Home, Studio and Gardens, a National Historic Site in Cornish, New Hampshire, just over the Connecticut River from Windsor, VT. 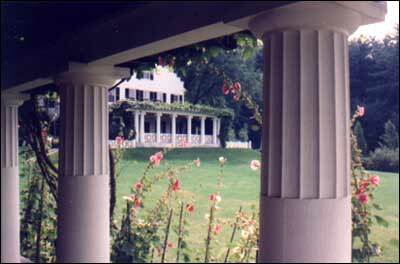 The large house, converted from an old inn, still contains the St. Gaudens family furnishings, and can be seen by guided tour. The studio is in a beautifully renovated barn, and scupture and fountains adorn the gardens that wind around the buildings, set on a hill with fine views. St. Gaudens' best-known works include the Robert Gould Shaw Memorial on the Boston Common and a haunting memorial to the wife of Henry Adams in Washington, D.C., which are also represented here in casts. In addition to the Diana, Catherites will appreciate the gilded copper reduction of a portrait of Robert Louis Stevenson—one of the young Willa Cather's great literary heroes—from St. Gaudens' memorial to the writer at St. Giles Cathedral in Edinburgh. For visits to both the St. Gaudens and Plymouth sites, lodging is also available in nearby towns, including Woodstock, Quechee, and White River Junction. Woodstock and Quechee are tourist sites in themselves, the former famous for resorts and well-heeled clientele (reserve well in advance); the latter for its dramatic gorge. Best Western. White River Junction has no pretensions of any kind, but it boasts a Best Western on Rt. 5, near the convenient junction of I-91 and I-89; phone (800) 370-4656. Quality Inn , Quechee Gorge, Rt. 4, Quechee, VT 05059, phone (800) 732-4376. Pond Ridge Motel, Rt 4, Woodstock, VT phone (802) 457-1667. Woodstock Inn and Resort, 14 The Green, Woodstock, VT 05091, has dining. Phone (802) 457-2500. Visit Vermont Chamber of Commerce (select Central Vermont) or Vermont Living Magazine (South-Central Vermont) ) for other links to maps, inns, motels, and restaurants in the area.